Prince Charles Maurice de Talleyrand-Perigord, Bishop of Autun, 19th century European diplomat, was a Newark resident for approximately six months in 1794. As incredible as it may sound, Talleyrand actually lived in Alling House on Broad Street, across from Rev. 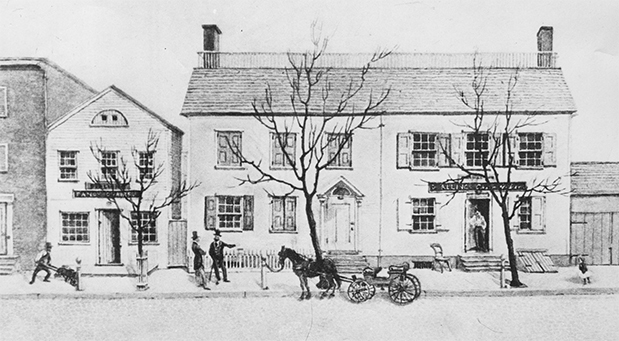 Alexander MacWhorter's parsonage. Controversial at home and feared abroad, Talleyrand was posted to London in 1792 prior to the September massacres of the Jacobin community which resulted in the murder of 1,000 royalists and priests. While living in Britain, he was asked to leave, and it was then that he found his way to America. At first he lived in New York, and then moved to Philadelphia where he was engaged in a variety of financial activities, but it is the six months spent in our town that draws our attention. There are two schools of thought about what he was doing in Newark. One group held that he taught French or made fine furniture. Maybe, but is it really plausible that Europe's master politician was a teacher or cabinet maker? Others agreed with Alexander Hamilton, that Talleyrand was here in the newly independent nation with a more sinister plan. Interesting, isn't it? The Prince made his home at the house of David Alling, and for this reason it later became known as Frenchman's Place. It was there that he wrote 'Mémoiresur les relations commerciales des États-Unis avec l'Angleterre', a few years after the Viscount de Chateaubriand began his own 'Le Genie Du Christianisme,' in the same house. He later completed it in London and published it in Paris. The Alling House seen in the accompanying photograph had two floors. The first served as a furniture workshop where some of America’s most beautiful chairs, sofas, and sideboards were produced. The second floor was used for living purposes. Today, excellent examples of Alling’s craftsmanship can be found in the great furniture collections of the Newark Museum. Talleyrand departed Newark after his brief stay. If any stir was created by his presence, it soon dissipated as the townspeople went about their mundane pursuits.